7/52 You are the weakest link, goodbye! I have a friend named Gugu. We met at varsity, but late into varsity when original friendships had been stress tested with most failing to meet the mark. So when I met her, I was just a little more mature and had significantly less drama (read fewer friends). In any case, I looked up to her. She was so grounded, so confident and self-assured and frankly, she was just a boss babe. Total girl crush material. The one thing that constantly had me puzzled was how quickly she went through friends. I mean, yes there were a few that had been around for a while but with the size of Grahamstown, it was fairly easy to notice how many former friends she had. But this isn’t about Gugu. It’s what I’m grateful I learnt from her. Probably the single most important criteria by which I define my friendships. I asked her about the high turnover one day (because I was worried I might be next, and I really like Gugu so I wanted to stick around). She said something to the effect of “Rue, I need loyal people around me. This stuff we’re dealing with is small and insignificant; ‘I kissed someone who wasn’t my boyfriend’, ‘I might be pregnant’. But we’re growing up. Soon it will be ‘I’m not sure my husband is my child’s father’ or ‘ I embezzled from my employer’, ‘I’m HIV positive'”. “I won’t have people I can’t trust around me“. This conversation is a reality check for me, even to this day. I often look at myself using that criterion to understand if I’m actually being a friend or I’m just using up time and energy in their surrounds. Similarly, I expect my friends to operate with a level of awareness of treachery. We’re grown now, and this isn’t mickey mouse clubhouse. My boundaries and expectations are very clear. If you step out of formation or betray my trust in any way, my immediate reaction is to cut my losses and run. I don’t expect blood oaths, but what I know for sure is that I do not want people whose intentions I don’t trust around me. It’s simple enough. And then I saw this on Facebook. People like to test us, huh? This is one part of a 52-week post a week challenge on gratitude. You might also enjoy reading other parts of this series. Click here to see more. 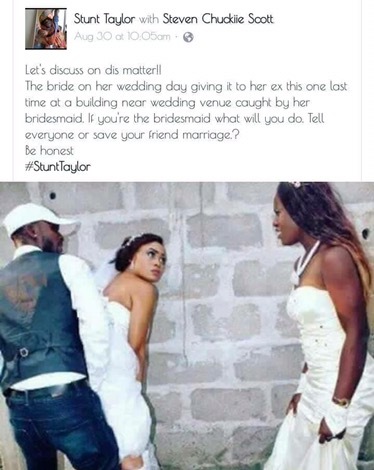 So much depth here…as for the last scenario (bride, her ex and the bridesmaid). Accountability is key, she (bride)has to be held accountable for her actions…at the same time there’s the don’t judge factor. All I can say is I’m glad that I don’t have friends who’d do that. Not my monkey, not my circus might be my approach.